So let me turn then to what will prove to be a very similar story for acupuncture. The first question we faced for acupuncture trials was, what should we use for a sham therapy? What would our control group be? And we decided we would test a strategy of using toothpicks as an alternative form of acupuncture where we put the toothpick inside a guide tube just as we would do with a real acupuncture needle. These are the guide tubes here, and the therapist would tap on the toothpick and create a sensation of a poke, but there’d be no skin penetration. And we decided to test this strategy to see how credible it was in a couple of ways. We first did a study with 10 acupuncture-naïve subjects who got six pokes with a toothpick, six pokes with real needles, administered in random order, and asked after each of those pokes whether this was a real needle or a toothpick that they were being poked with and asked the subjects to rate this on a 1-to-5 scale, where 1 was definitely real, and 5 was definitely fake. I was a subject in that pilot study, and I can tell you that I was absolute, completely fooled. I was certain that some of the toothpicks were real needles, and I was certain that some of the needles were just toothpicks. So I came away as a believer that this was a fairly effective sham. The second study, we randomly allocated 52 patients to get real needling or the toothpick administration, and here are the results of these studies. I wasn’t the only one who was fooled in the first study. It turned out that toothpicks were perceived as being slightly more like real needling than the actual thing with slightly lower scores for the toothpicks than for the real needling– not quite statistically significant. And in the second study, 52 percent of the patients who were randomly allocated to get toothpick therapy thought that it was definitely or probably real compared with 65 percent in the real acupuncture group, a non-statistically significant difference. So we came away believing that this was at least convincing and embarked on a randomized trial where we enrolled over 600 patients this time. And unlike the chiropractic trial with acute back pain, these were all patients who had chronic back pain. They were treated by one of seven acupuncturists who took part in the trial, and patients were given up to 10 treatments over the span of 7 weeks. So, as I recall, they had two treatments a week for the first three weeks and then four subsequent weekly treatments. And in this trial, we had four arms. The first was real acupuncture with the individualized placement of the needles. So the therapist examined the patient, decided where he or she thought the needles would be most effective and used that needle placement. The second group got real acupuncture also. But instead of individualizing the points, they were administered at standard points that we had set ahead of time-based on a consensus among the acupuncturists that these would be the most likely effective points for most patients on average. Then we had the sham acupuncture group with the toothpicks, and then we had a usual care arm. And we followed these patients, again out to one year in this case, and again happily had better than 90 percent followup at all of those time points. These two real acupuncture groups, I will tell you now, had virtually identical results. And so in a couple of the slides, I’ll show you of the results, I’ll just refer to them as “real acupuncture, combining these two arms. So here’s a figure that looks a lot like what I showed you for the chiropractors. This is an improvement in the pain severity or bothersomeness. And what you see here is that at eight weeks of follow-up, everybody was getting somewhat better. The least improvement was occurring in the usual care arm. And here, you see the most improvement by a small amount was in the simulated acupuncture arm. But the three real and sham acupuncture groups tracked each other almost perfectly throughout the entire year and were indeed indistinguishable on a statistical basis from each other. There were differences from the usual care arm early on. But again, as you can see over time, there tended to be some convergence of the results between the usual care group and the acupuncture groups at a year. The same kind of graph this time for the Roland disability score, and again you see some separation here at eight weeks, a little bit of convergence over the span of a year. But again the three groups, the real acupuncture groups, and the sham acupuncture groups, are virtually indistinguishable regarding their effects over that entire year. And here’s another way of presenting those results that I kind of like. It asks, instead of what are the average scores, what percentage of patients had a clinically important magnitude of improvement? And we chose 3-point improvement on the Roland Morris scale to represent a clinically important improvement and asked what percentage of patients had improvement by that amount. And the answer was, for both the real and the sham acupuncture groups, 60 percent had that level of improvement at eight weeks– and you’ll recall that’s where the separation was the greatest– versus only 39 percent in the usual care arm. And one other secondary outcome measure that we looked at was the use of pain medications, and again you see that the real and sham acupuncture groups are virtually identical and had somewhat lower use of pain medications than patients in the usual care arm. These differences persisted at a significant level out to one year. So how do we interpret these results? Well, one interpretation would be that fake acupuncture was just as good as real acupuncture, so all the benefits of acupuncture seem to be placebo effects. A second interpretation would be that both true and sham. Acupuncture really work, and you don’t really have to penetrate the skin in order to have them work, and you just need to cause some stimulation that maybe creates a counter-perception in the brain, and maybe they’re both actually having a better than the placebo effect. In either event, I think it’s fair to say that, from our trial, we sort of challenged the concept that the precise placement of the needles or even penetration of the skin makes an important difference– certainly a challenge to the concept of the traditional acupuncture meridians. And if you look at other studies, there are some interesting clinical trials of acupuncture. This is one of the most recent that is a meta-analysis of individual patient data from 29 randomized trials. So these investigators went out to the original authors of 29 different randomized trials of acupuncture and tried to collect individual patient data from each of those trials. 10 of those trials were for back pain in particular. And the conclusion after analyzing, again, individual patient data was that acupuncture actually seemed to be superior both to sham acupuncture, and to the non-acupuncture control groups, but the difference over sham acupuncture was quite small, and the results looked quite similar whether you were looking at patients who had back pain or osteoarthritis or a headache or shoulder pain. And, again, as in our trial, they concluded from this individual patient data that the location of the points and the depth of the needling were not important. More conventional systematic reviews of the clinical trials have a range of interpretations. Edzard Ernst is sort of a skeptic who concludes from the systematic reviews that are available that there’s little convincing evidence that acupuncture is effective. On the other hand, Brian Berman says it’s not clear whether acupuncture is superior to sham acupuncture, but [it] may be more effective than usual care. And again, on the safety side, it’s pretty encouraging. Serious adverse events are very rare. One estimate again from observational studies is maybe somewhere in the range of one in 100,000 treatments there might be a serious adverse effect. 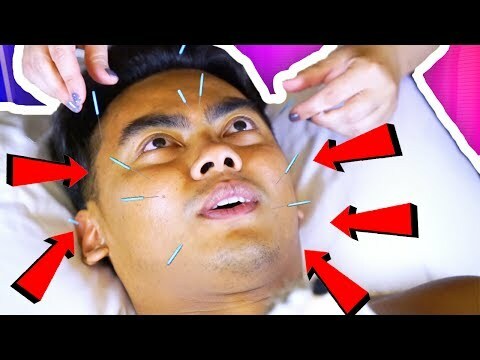 So, again, a very safe treatment..
Shiatsu Massage Tips & Techniques : How to Use Shiatsu for a Migraine Headache - Interview with an Acupuncturist - Acupuncture Studies - How to Locate Proper Acupuncture Points - GUAVA GETS AN ACUPUNCTURE!